Definition at line 24 of file crtd_message.h. Definition at line 27 of file crtd_message.h. Definition at line 34 of file crtd_message.h. Definition at line 29 of file crtd_message.h. Definition at line 90 of file crtd_message.h. Definition at line 17 of file crtd_message.cc. Definition at line 134 of file crtd_message.cc. References BEFORE_CODE, body, body_size, code, current_block, and state. 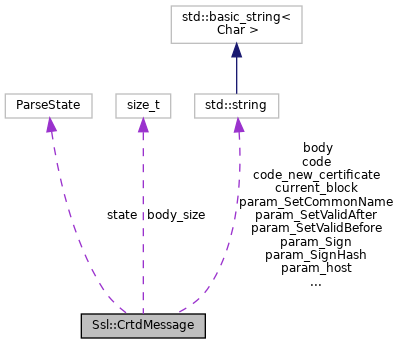 Compose current (request) code and body to string. Definition at line 126 of file crtd_message.cc. Referenced by ConnStateData::getSslContextStart(), processNewRequest(), Ssl::Helper::Submit(), and Ssl::CertValidationHelper::Submit(). The other multistring part of body. Definition at line 166 of file crtd_message.cc. Definition at line 239 of file crtd_message.cc. References Ssl::algSetCommonName, Ssl::algSetValidAfter, Ssl::algSetValidBefore, Ssl::algSignEnd, Ssl::appendCertToMemory(), body, Ssl::CertAdaptAlgorithmStr, Ssl::certSignAlgorithm(), code_new_certificate, Ssl::CertificateProperties::commonName, Security::LockingPointer< T, UnLocker, Locker >::get(), Ssl::CertificateProperties::mimicCert, param_host, param_SetCommonName, param_SetValidAfter, param_SetValidBefore, param_Sign, param_SignHash, Ssl::CertificateProperties::setCommonName, Ssl::CertificateProperties::setValidAfter, Ssl::CertificateProperties::setValidBefore, Ssl::CertificateProperties::signAlgorithm, Ssl::CertificateProperties::signHash, Ssl::CertificateProperties::signWithPkey, Ssl::CertificateProperties::signWithX509, and Ssl::writeCertAndPrivateKeyToMemory(). Definition at line 118 of file crtd_message.cc. Referenced by ConnStateData::sslCrtdHandleReply(), and sslCrtvdHandleReplyWrapper(). Definition at line 120 of file crtd_message.cc. ERROR if there is an error. Definition at line 21 of file crtd_message.cc. References BEFORE_BODY, BEFORE_CODE, BEFORE_LENGTH, BODY, body, body_size, clear(), CODE, code, current_block, END, ERROR, INCOMPLETE, LENGTH, OK, state, xisalnum, xisalpha, xisdigit, and xisspace. Referenced by main(), ConnStateData::sslCrtdHandleReply(), and sslCrtvdHandleReplyWrapper(). Definition at line 143 of file crtd_message.cc. Definition at line 178 of file crtd_message.cc. References Ssl::algSignEnd, Ssl::algSignTrusted, Ssl::certSignAlgorithmId(), Ssl::CertificateProperties::commonName, i, Ssl::CertificateProperties::mimicCert, param_host, param_SetCommonName, param_SetValidAfter, param_SetValidBefore, param_Sign, param_SignHash, parseBody(), Ssl::readCertAndPrivateKeyFromMemory(), Ssl::readCertFromMemory(), Ssl::CertificateProperties::setCommonName, Ssl::CertificateProperties::setValidAfter, Ssl::CertificateProperties::setValidBefore, Ssl::CertificateProperties::signAlgorithm, Ssl::CertificateProperties::signHash, Ssl::CertificateProperties::signWithPkey, Ssl::CertificateProperties::signWithX509, and SQUID_SSL_SIGN_HASH_IF_NONE. Definition at line 122 of file crtd_message.cc. Definition at line 124 of file crtd_message.cc. Referenced by ConnStateData::getSslContextStart(), processNewRequest(), and Ssl::CertValidationHelper::Submit(). Definition at line 101 of file crtd_message.h. Referenced by clear(), compose(), composeBody(), composeRequest(), Ssl::CertValidationMsg::composeRequest(), getBody(), parse(), parseBody(), Ssl::CertValidationMsg::parseResponse(), and setBody(). Definition at line 99 of file crtd_message.h. Referenced by clear(), and parse(). Definition at line 102 of file crtd_message.h. Referenced by clear(), compose(), getCode(), parse(), and setCode(). Definition at line 76 of file crtd_message.h. Referenced by composeRequest(), ConnStateData::getSslContextStart(), main(), and usage(). Definition at line 103 of file crtd_message.h. Definition at line 78 of file crtd_message.h. Referenced by composeRequest(), Ssl::CertValidationMsg::composeRequest(), parseRequest(), and usage(). Definition at line 84 of file crtd_message.h. Referenced by composeRequest(), and parseRequest(). Definition at line 80 of file crtd_message.h. Definition at line 82 of file crtd_message.h. Definition at line 86 of file crtd_message.h. Definition at line 88 of file crtd_message.h. Definition at line 100 of file crtd_message.h.